Product Hunt, a community board where people can up vote tech products, officially announced the raise of $6.1 million in a Series A today, led by Andreessen Horowitz. Y Combinator partner and Reddit co-founder Alexis Ohanian took part in this round as a new investor to the company. Ryan Hoover, the founder of Product Hunt participated in the summer 2014 class at Y Combinator but he tells us that Ohanian actually was hooked on his site before YC days. “Garry Tan introduced me [to Alexis Ohanian] and we Skyped for an hour. He immediately got what we were building and provided me with advice on how he built the community in the early days of Reddit,” says Hoover. Ohanian says he invested in the Series A round mainly because he’s a user of the product and always on the site. “I’m really impressed with the community Ryan and the team have built around the product. Very few startups do this well and it’s something I look for as an investor, given my own background with building communities around Reddit and Hipmunk…What reddit has done for communities sharing content, Product Hunt will do for communities sharing things,” Ohanian said in an email exchange. Certain participants from the previous round also came on board with the Series A, including: A-Grade Investments, Abdur Chowdhury, Andrew Chen, betaworks, Cowboy Ventures, CrunchFund, Greylock, Ludlow Ventures, Naval Ravikant, Nir Eyal, Slow Ventures, SV Angel, and Tradecraft. 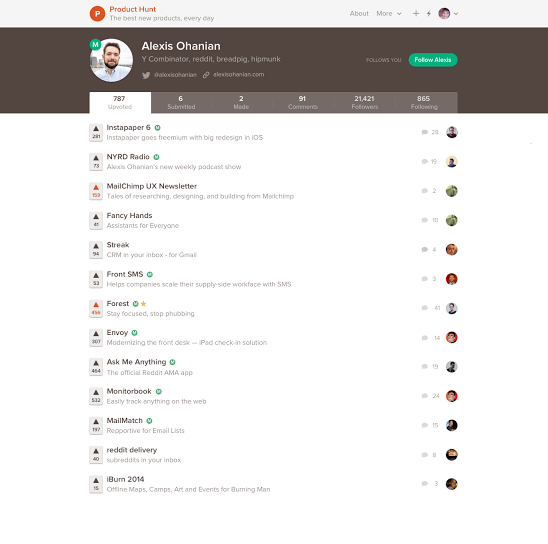 The new funding brings Product Hunt’s total investment to date to $7.1 million. Product Hunt also announced that A16Z partner Steven Sinofsky will now join the board of directors for the company. “Product Hunt’s uniqueness comes from the full breadth of activity around new products and those enthusiastic about them. It’s a place to launch, learn, share and curate. We strongly believe in Product Hunt’s vision,” Sinofsky explained on why A16Z chose to invest. Founder Ryan Hoover launched Product Hunt as an “experimental” email newsletter about products he liked in late 2013. The startup ballooned in popularity since its humble beginnings and has since become a destination site where folks could submit and vote on their favorite tech products. It also launched an open-source API and an iOS app earlier this summer. The site now hovers at about 80k users, the majority of them based in Silicon Valley. This is different from visitors. Hoover says those are in the hundreds of thousands every day. You can see Hoover discuss the genesis of Product Hunt and his “super-hero origin story” in this interview with our writer Josh Constine at TechCrunch Disrupt SF 2014.